Here is just one example of the action that most of the veterans looked forward to throughout the day. 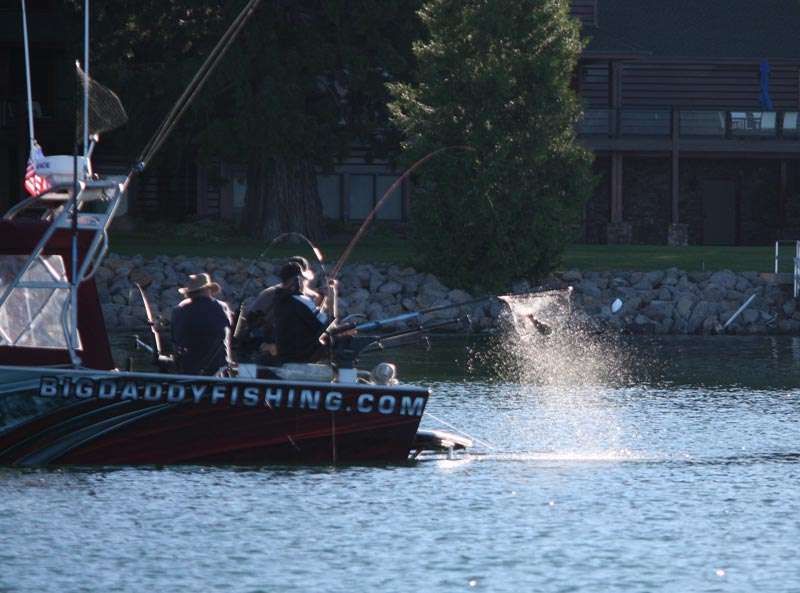 It seems that all the boats were successful in catching fish during the day and some, according to the bragging at lunch, had the best day of their lives. 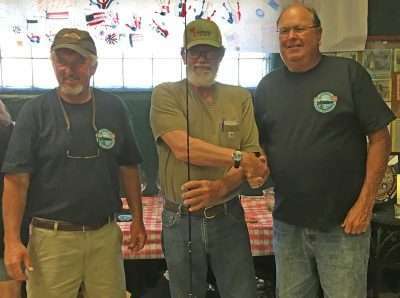 For the second year in a row the Almanor Fishing Association (AFA), in collaboration with Field of Dreams, made it possible for 40-plus veterans from Plumas County and beyond to enjoy a day of relaxation, conversation and share a fascination with fishing on one of the greatest lakes in northern California. 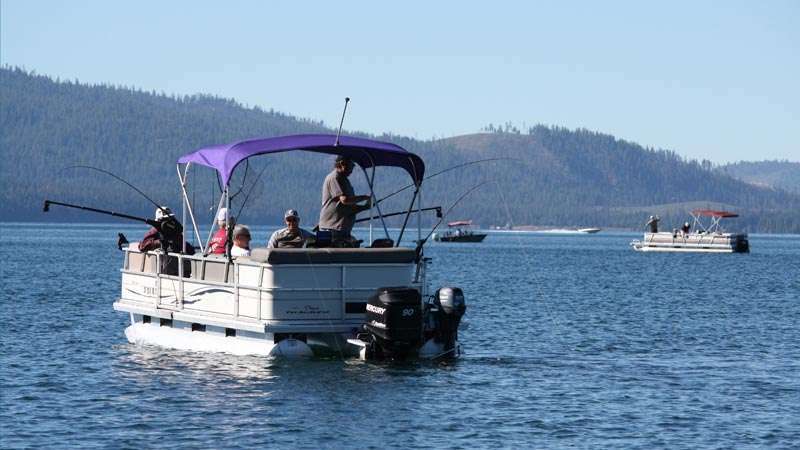 Very early Sunday morning, June 24, numerous boats — 27 to be exact — started making their way out to different locations on Lake Almanor with their special guests of well over 40 veterans in pursuit of those lunkers lying in the depths below. The weather this year was “absolutely marvelous” and the fish almost seemed to know what an honor it would be to be caught by an American veteran as they jumped onto hook after hook. 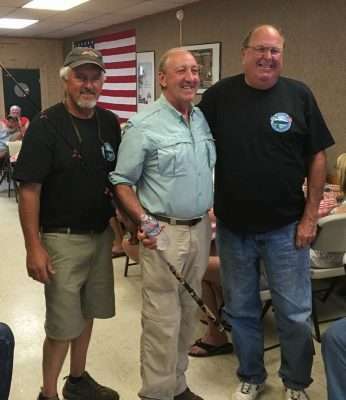 AFA President John Crotty had nothing but praise for all the professional guides and other boat captains that made themselves and their boats available to take the 46 veterans out for a day on the lake. He also talked about the long, long list of volunteers and organizations that supported the event in so many ways. A special thanks to Field of Dreams, which donated a two-person Waterfowl Hunting Trip as one of the door prizes as well as purchasing the meat and tableware for the barbeque lunch. 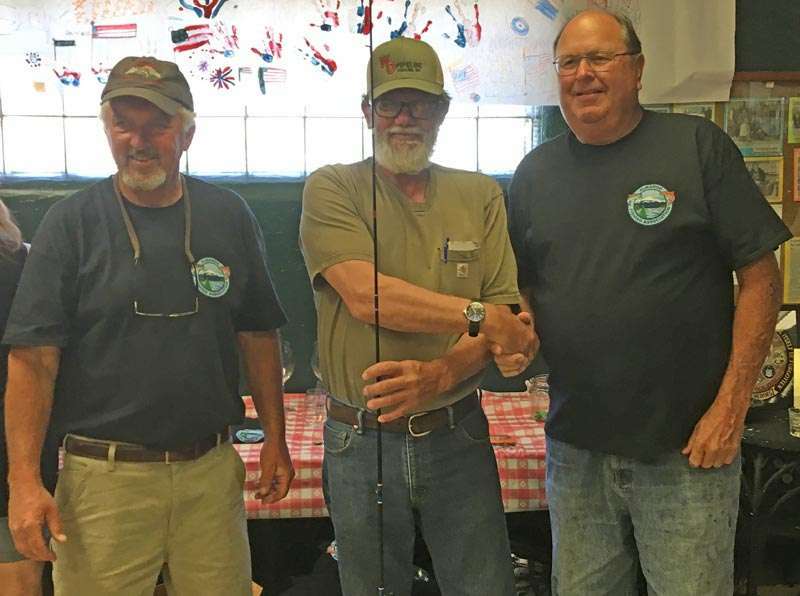 Brian J. O’Rourke from Rocklin stands between AFA President John Crotty, left, and Duncan McIntyre, holding one of two custom rods created by McIntyre especially for the Veterans Day on the Lake event. They also gave a participant hat to everyone. Field of Dreams is a nonprofit organization that has been supplying outdoor adventures for veterans and special needs children since 2004. AFA member Mike Daly supplied the specially designed shirts given to all participants and Duncan McIntyre of Mac’s Rods donated two “one-of-a-kind” fishing rods especially designed for this event. Crotty thanked the Lake Almanor Elks for offering their facility for the lunch. Besides cooking the meal, members provided potluck side dishes to round out the tri-tip and chicken barbeque, and manned a no-host bar. Admittedly, there were just too many people to list that made the day such a success and Crotty was overwhelmed by the outpouring of support from the community. Not to be overlooked as mentioned by numerous AFA members and attendees alike, Crotty and his wife Deb were in no small way a reason for the success of the event. Amongst other things, they provided rooms for veterans, a guide boat, and received and organized all the reservations and deployment of the boats.